Monsters Inc was and is a fantastic film. It deftly creates a complex, surreal and comprehensible world that makes a weird amount of sense. I imagine there's tonnes of stories that can be done within this universe, yet Monsters University focuses on one of the more prosaic and (frankly) kind of dull. 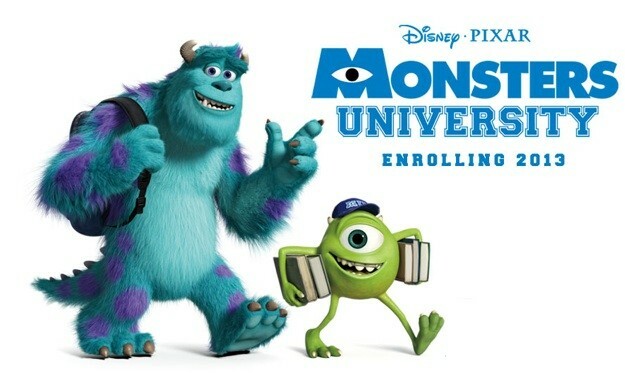 Was there anyone that walked out of Monsters Inc dying to know just how Mike and Sully got their qualifications? Does Pixar imagine that this is the story we're clamouring to hear? 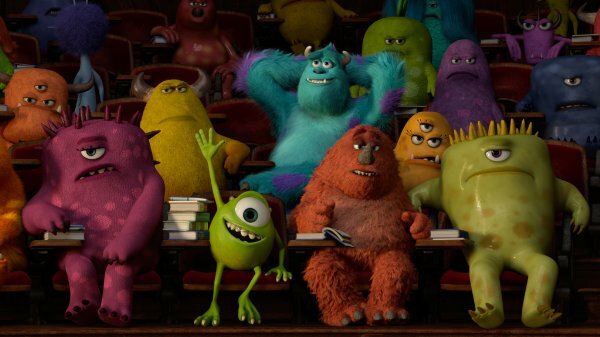 Do they picture people idly wondering either they went to technical college or university, what they majored in, perhaps even speculating on the subject of Mike Wazowski's no doubt meticulously researched dissertation. Now, finally, we learn the answers to these burning questions. The fact that it's come to this - a Pixar prequel - is vaguely depressing. There's a sense of a wasted opportunity whenever Pixar create another entry in one of their existing franchises, a disquieting sense that the film is simply a cash-cow, occupying a place in Pixar's production schedule that an imaginative new idea could have filled. Of course, there's always the magnificent Toy Story 3 acting as a counter-argument, but then there's also the crushingly awful Cars 2. 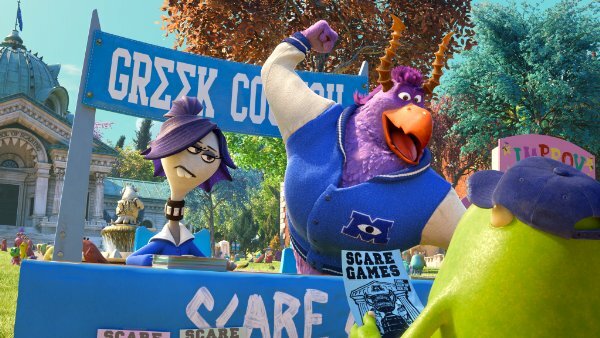 Monsters University falls somewhere between these camps, being neither terrible nor sparklingly good. Most of the reasons for this mediocrity boil down the inherent lack of tension in a prequel. It's surprisingly difficult to think of any genuinely good film prequels that compliment the films they narratively precede (Casino Royale, Rise of the Planet of the Apes and half of Godfather Part II?). The crux of the problem is obvious; we know exactly what's going to happen to these characters, and more importantly, we know that they're guaranteed a happy ending. This drains the emotional reaction from the film; and getting an audience to entirely buy into the emotional wallop is Pixar's trump card. Predictably, the film adopts the framework classic US college comedy; our protagonists being part of a loveable group of misfits working against a stuffy old dean and a snooty, stuck up preppy frat. I feel like I've watched this film a hundred times, most recently just last week with the dire The Internship, hell, 20 years ago The Simpsons skewered most of these tropes in 20 minutes. 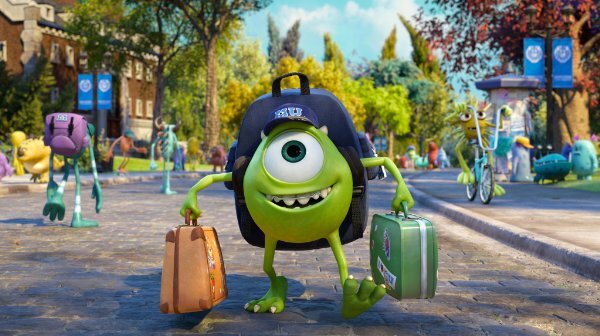 We join Mike and Sully as freshmen on their first day at Monsters University and very quickly the two begin stepping on each other's toes. 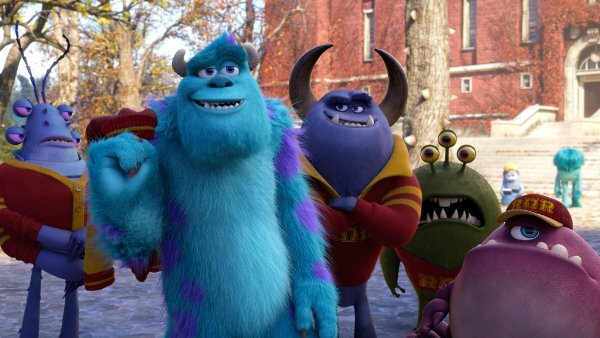 Mike is constantly working hard, studying every moment to be a great scarer, while Sully is happy to coast by on his family 's reputation and his god-given natural scaring ability. After a chain of unlikely events, they're both faced with the prospect of being kicked out of the University unless they can win 'The Scare Games'. Will Mike and Sully ever get over their differences and become fast friends? Will they achieve their dream of working on the famous 'scare floor' at Monsters Inc? Will they learn the true meaning of teamwork? Yes, yes and yes. Obviously. It seems a bit condescending to point out that a Disney/Pixar film is going to have a happy ending - even when, as in this case, we've seen the happy ending. What Pixar have mastered is getting us to utterly suspend our disbelief and plot-savvy cynicism, managing to work some weird alchemy that fools us into thinking that everything has gone irretrievably wrong. I'm thinking of the moment in Wall-E where you're SURE his memory has been wiped, or in The Incredibles when Bob sees his entire family apparently dying in an explosion and (most notoriously) in Toy Story 3, where we see our loveable toy heroes accepting the inevitability of their deaths, and holding hands as they're fed into an incinerator. No escape. No way out. It's grim. There's none of this in Monsters University. They don't even try for the illusion of tension, so what's left is a light-hearted comedy caper. This isn't such a bad thing, and the film at least works on this unambitious level. There's a bunch of reasonably smart gags throughout and though there's no stand-out new characters, those that we're introduced to are at the very least vaguely interesting. Slightly more problematic is that (once again) this is explicitly a 'boys' film. The primary and secondary cast are entirely male, with the only woman in the film taking the antagonist role (and even then she's not that well developed, though being voiced by Helen Mirren goes a long way towards adding character that's not present in the script). After the flawed but well-intentioned Brave I thought Pixar might have gotten over this problem. It feels like an unnecessary narrowing of their audience. The thing is, when Pixar settle for 'average' it's more of a crime than when another studio does the same. Few film studios have repeatedly hammered on my heart with such precision, and these kids films are about rat chefs, garbage cleaning robots and lost fish make me go all gooey-eyed with alarming regularity. I watched Up about a fortnight ago, and it hit me like a literal punch; I was trying so hard not to blubber that I felt an actual dull pain in my head. If a film studio can make me feel like that, then settling for a light-hearted comedy that doesn't do anything particularly wrong, yet never shoots for the stars is a waste of their talents. The worst thing about of Monsters University is that, like Cars 2, it's a film that feels like a product rather than an artistic endeavour. Some bean-counter in Disney HQ has done a market-awareness analysis on Pixar's back catalogue and decided that the time is ripe for a sequel to Monsters Inc. So we've ended up with Monsters University, a slick, polished, largely professional piece of cinema, yet one almost entirely devoid of the passion, emotional depth and artistic risk that characterises Pixar's best work.